Peaberry is actually an anomaly in which only one half of the bean becomes germinated. This singular development results in a smaller round berry, rather than the typical flat double berry. It occurs in only 3% to 5% of the average crop. Because it is rarest, it is the most expensive, Peaberry is said to produce the most robust flavor of all Kona Coffees. Extra Fancy Grade includes only the largest beans. These beans are somewhat rare and comprise about 20% of the harvest. They are known for their smooth, mild flavor. Many coffee lovers prefer the Extra Fancy grade to serve to their guests. Kona Number 1 is made up of medium size beans. It has a stronger, more robust flavor but retains the characteristics Kona mildness. It is normally used for commercial grade sales. Kona Prime is the smallest of all the Kona Coffee beans. This grade is not as smooth or mild as the higher grades but is still maintains a very good flavor. It is considered the lowest grade of coffee to be certified as Kona Coffee. Kona Select consists of coffee beans that have not been sorted by size. It contains all the above grades of beans. This grade is usually less expensive than the other grades. These are beans that do not meet the standards of the higher grades of coffee beans. This grade cannot be certified as Kona Coffee but rather Hawaiian Coffee. As with most things, the better the quality – the higher the price. In our opinion a great grade to start with is the Kona Extra Fancy. One option is to try a gift pack that consists of several different products. 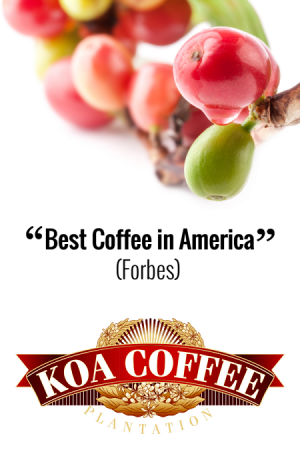 Our recommended supplier is KOA COFFEE. We have provided a link below.